Colorado State University chemists have done the impossible: they’ve synthesized a fully recyclable, biodegradable polymer. Their work will not only keep countless tons of plastic from piling up in the landfills in the future, but also break petroleum’s grip on the polymer industry. 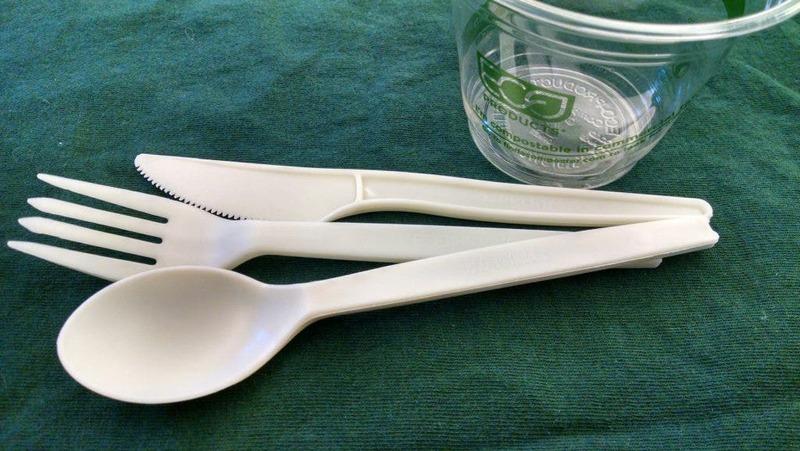 Compostable cutlery and other products made from the biomaterial PLA are biodegradable, but not fully recyclable. The breakthrough comes form chemistry professor Eugene Chen’s lab, who was recently awarded the Presidential Green Chemistry Challenge award for his work. Chen and postdoc fellow Miao Hong published their findings in the Nov.23 journal of Nature Chemistry, describing the polyester that when simply reheated for an hour converts back to its original molecular building blocks, ready for reuse. Chen’s lab is focused on making renewable and degradable plastics and other polymers to replace conventional petroleum-based materials. The duo started experimenting with a biorenewable monomer that the scientific community had previously declared non-polymerizable (meaning it couldn’t form the long molecular chain structure that make up polymers.) This was what you could call a bit of a setback, as the tiny molecular monomers themselves aren’t readily usable as materials — they need to be tied to each other to create a cohesive, solid material such as plastic. But it’s exactly this cohesiveness that makes plastic both incredibly useful and hard to break down; the long polymer chains, while very hardy, are extremely chemically stable being almost impervious to attacks. Plastics like polyethylene and polystyrene are the current superstars of synthetic polymers, and have come under fire for piling up in landfills with almost no known biological process that can break them down. “More than 200 pounds of synthetic polymers are consumed per person each year – plastics probably the most in terms of production volume. And most of these polymers are not biorenewable,” Chen said. Biodegradable plastics aren’t new; polylactic acid, or PLA, a starch-based material has been around for some time now and you might recognize it from the compostable cups, cutlery and packaging used in dining halls. PLA is biodegradable, but not truly recyclable — once processed into goods, PLA can’t be reconstituted into its original monomeric form without the formation of unwanted byproducts. Soda bottles, cups, keyboards and a myriad of other plastic products are marked as recyclable because they can be repurposed to extend the product’s lifecycle, but from a chemical point of view, they’re not “recyclable” — they can’t be used to make an object, then broken down to the initial molecules by simply heating the polymers. A graphical illustration of the researchers’ polymer synthesis process. The single molecules, or monomers, are cooled in order to polymerize; to cycle back, heat is applied. The feedstock Chen and Hong started from is named Gamma-butyrolactone (GBL), a liquid, colorless and fairly common chemical reagent derived from a top-12 biomass compound best suited to replace petrochemicals, according to the Department of Energy. Scientific literature had GBL marked down as too thermally stable in their monomer state to polymerize. In the end, the material Chen and Hong developed could not only be made to polymerize, but they even figured out how to make it form linear of cyclic shapes by altering environmental conditions and changing catalysts. They used both metal-based and metal-free catalysts to synthesize the polymer, called poly(GBL), which is chemically equivalent to a commercial biomaterial called poly(4-hydroxybutyrate), or P4HB. 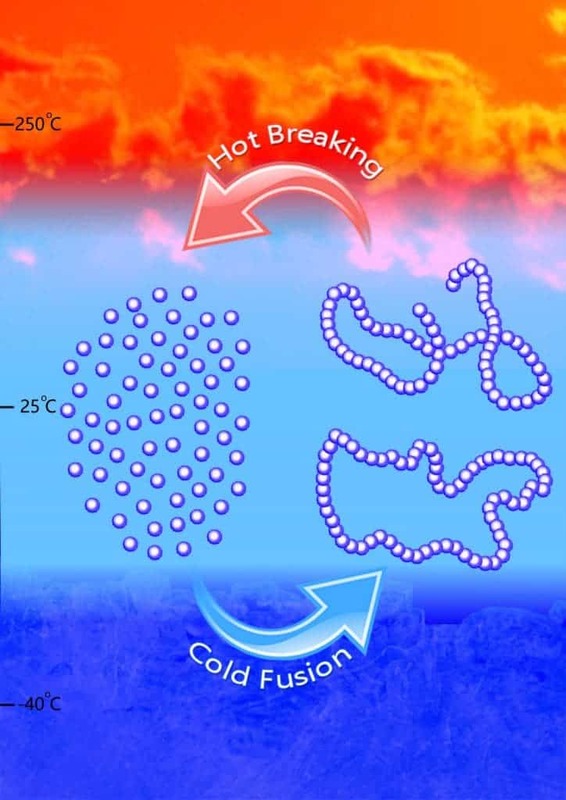 They developed precise reaction conditions that allow the GBL to polymerize at low temperature, and a process involving heat between 220-300 degrees Celsius (428-572 Fahrenheit) that breaks the polymer down into the original monomer, making it the first truly chemically recyclable plastic ever developed. Poly(GBL) is also cheaper to make than its main competitor, P4HB, that is derived from bacterial activity in a much more complex and expensive process than those of most other plastics. By starting with the readily available GBL and ending up with a replacement material for P4HB, Chen’s discovery has promising market potential, and a provisional patent has been filed with the help of CSU Ventures.